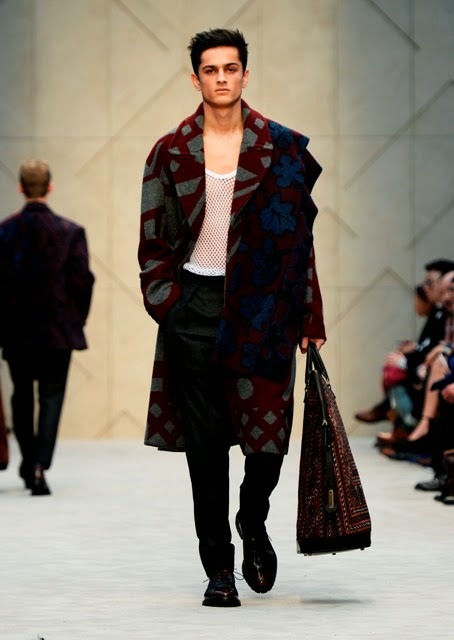 Burberry Prorsum’s Menswear Autumn/Winter 2014 collection is called ‘A Painterly Journey’ and was showcased in London’s Kensington Gardens. 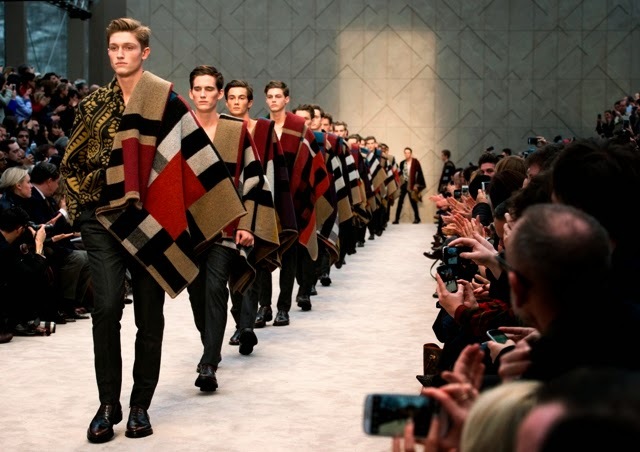 Burberry, recently recognized as Menswear Designer of the Year at the 2013 British Fashion Awards, showed the collection as part of the fourth London Collections: Men week. British Burberry Acoustic musician Sivu played a live set as guests arrived at the custom-built show space on East Albert Lawns, followed by a performance by British musician George Ezra after the show. Guests included British actors Jamie Campbell Bower and Callum Turner, Chinese actor Chen Kun and Korean actor Yu Ah In; British musicians Tinie Tempah, Paloma Faith, James Righton, Jack Bevan and George Barnett; British model Suki Waterhouse, British presenters Nick Grimshaw and Dermot O’Leary, and digital entrepreneur Jamal Edwards (SBTV). The British show soundtrack featured musicians Paloma Faith, The Night VI and Patrick Wolf as well as a specially recorded track by Clare Maguire. Introducing knitwear and scarves for the first time, key ready-to-wear and accessories from the collection are available to purchase and personalize. Personalized nameplates can be added to custom-made outerwear, bags and knitwear, as well as embroidered onto scarves. Through Runway Made to Order, customers can also create bespoke versions of the St Ives bag that is featured in the collection, with six iconic global city skylines available to combine with a selection of leather backgrounds. In addition, one-off hand-painted St Ives bags are also available to order, alongside versions crafted from individual rugs and blankets, making each piece unique. Viewers globally were able to experience the show instantly through video, imagery and music across multiple Burberry platforms including Burberry.com, Facebook, Twitter, Instagram, Vine, Pinterest, Google+, YouTube, YouKu, Sina Weibo, Douban, Sumally and WeChat. The WeChat platform delivered the most personalized Burberry social show experience to date. Using responsive text, followers could explore different show storylines by messaging keywords to unlock layers of content relating to the event and guests. The show experience on Burberry.com, fully optimized for mobile, allows users to follow the Burberry social stream, explore runway looks in detail and purchase and personalize the collection immediately after the show. In the Philippines, Burberry is exclusively distributed by Stores Specialists, Inc. (SSI) and is located in Greenbelt 4, Rustan’s Makati, and Rustan’s Tower. 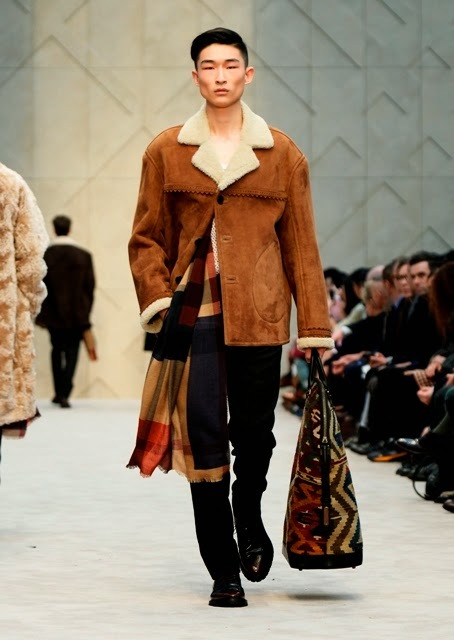 Labels: A Painterly Journey, Burberry Prorsum’s Menswear Autumn/Winter 2014 collection, George Ezra, Sivu, Stores Specialists Inc.